The Prince of Wales met Pragmalji ii, Rao of Cutch (1832–75), at Bombay, in November 1875. Here he was presented with this pair of rosewater sprinklers in the form of cranes holding a fish in their beaks. The fish have a bouquet of flowers issuing from their mouths, which have been perforated with holes to allow for the rosewater to be sprinkled. The strange iconography of the sprinkler may be linked with the legend of the two rival goldsmiths, Gangu and Nandu, working in the court of Anhilpur Patan, in modern-day Gujarat. The legend recalls that both goldsmiths were invited to take part in a contest of skill by the Solanki ruler, Jayasimha Siddharaja (c.1094– 1143). Gangu produced a gold fish, which could float and move in water. In response, Nandu produced a crane that pecked at the fish causing it to drown and thus won the contest. However, Nandu later incurred the wrath of the ruler and was banished from Patan, taking refuge in Cutch, where this tale inspired later metalworkers in the state. 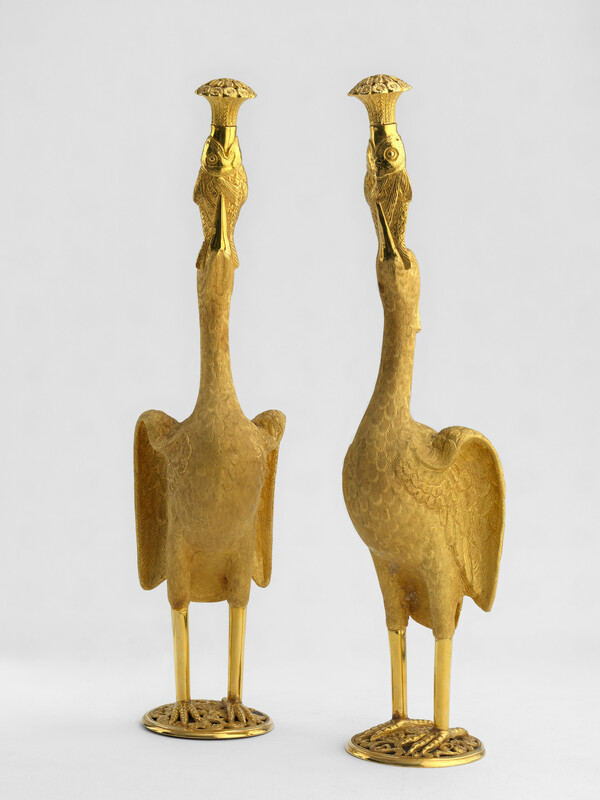 Silver versions of these sprinklers in other collections suggest that this pair, made from gold, were produced as unique presentation pieces for the tour.